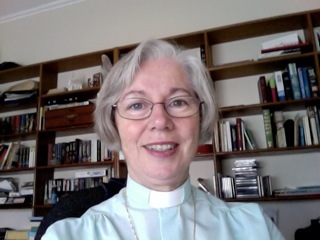 Following the departure of Fr Kim Benton to Kilmore Broadford, Archdeacon Sally Boothey from the parish of Plympton in the Diocese of Adelaide has accepted the appointment as rector of Numurkah Nathalia. She will be inducted by the Bishop on Thursday January 24th at 6pm. Although, as an archdeacon in Adelaide, I carry the title ‘Venerable’, I will be known as the Reverend Sally Boothey in Wangaratta. Please refer to me as Reverend Sally, or simply Sally. My background is in teaching – (Secondary School, Biology and Science) – but since my ordination in Gippsland Diocese in1996 I have been working as a full time priest, first in Gippsland Diocese, and then, for the past six years in Adelaide Diocese. I have also had experience as a School Chaplain. In 1974, Denis Boothey and I were married and we have four adult children, William, Jennifer, Carolyn and Christopher. We have six grandchildren – Carolyn is mother of Samsen and Poppy and Jenny is mother of Abigail, Jack, Brendan and Olivia. Denis is a Secondary School teacher, specialising also in science and biology. He also enjoys sport and works on old, big machines as a hobby. We lived as a family at Tambo Upper until my ordination. After that, with growing teenagers and then as ‘empty nesters’, we moved around Gippsland and finally to Adelaide. My own interests, (apart from religion, church and spirituality), include social golf and reading. The textile crafts of knitting, embroidery, quilting, cross stitch and crochet are all pursuits I enjoy. Of course family time is very special also. We have two dogs – Flash and Bindi. They are non-identical twin sisters with a border collie mother and a curly coat retriever father. They’re mainly outside dogs who provide both entertainment and exercise opportunities. In coming to Numurkah Nathalia, we are moving closer to family members and are leaving suburban Adelaide to return to a country area. We are both looking forward to meeting everyone in the parish community and to finding what blessings and challenges God’s calling will bring to our lives. In coming to be with the Parish of Numurkah Nathalia as priest and leader, I know that this is a call of God for me and I know therefore, that our journey together will be fruitful for God’s kingdom and, as always, a bit of an adventure awaits us all. In the end, we will do, and be our best for God’s purposes, strengthened and nurtured, as sisters and brothers in Christ, by the Holy Spirit, to live faithful, gospel lives. We will worship together, grow in faith, and share both joys and sorrows in the coming years – and we will find Christ’s life-giving presence amongst us and even his love within us. May the Advent and Christmas seasons be times of God’s peace and blessing for the parish. I look forward to being with you in the new year.